If you head out to one of Wisconsin's many lakes or rivers to ice fish, snowmobile, ATV, cross-country ski, or just to enjoy a winter day, we want you to have fun and be safe. A bit of advance planning and practicing basic ice precautions can help you return home safely. Bundle up for cold weather! There really is no sure answer, and no such thing as 100 percent safe ice. You cannot judge the strength of ice by one factor like its appearance, age, thickness, temperature or whether the ice is covered with snow. 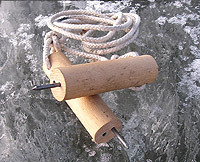 Ice strength is based on a combination of several factors, and they can vary from water body to water body. Ice strength can also vary in different areas of the same body of water. Because ice conditions vary, it is important to know before you go. 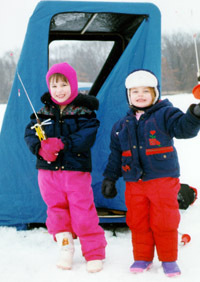 The DNR does not monitor local ice conditions or the thickness of the ice. Local bait shops, fishing clubs and resorts serve winter anglers every day and often have the most up-to-date information on how thick the ice is on local lakes and rivers, as well as areas that are especially dangerous. Don't go alone. Head out with friends or family. Take a cell phone if available, and make sure someone knows where you are and when you are expected to return. Carry some basic safety gear: ice claws or picks, a cellphone in a waterproof bag or case, a life jacket and length of rope. Drill a hole into the dowels (in the end opposite the nail) and tie a length of strong cord through the hole so a pick is on each end "jump-rope" fashion. You may also drill a hole in the ends alongside the nails so the nail on the other pick can nest in the hole, keeping both points covered. Keep the picks in your pocket for quick emergency access if you or a companion do break through.